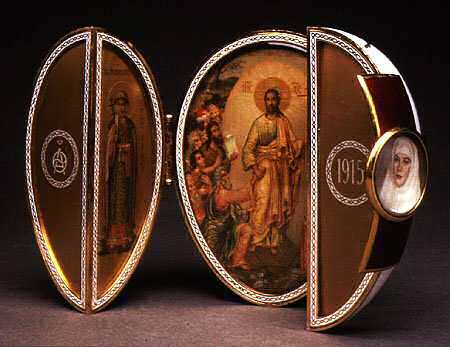 The 1915 Red Cross Egg with Triptych is made of silver, gold, opalescent white and translucent red enamel, watercolor on gold and glass. 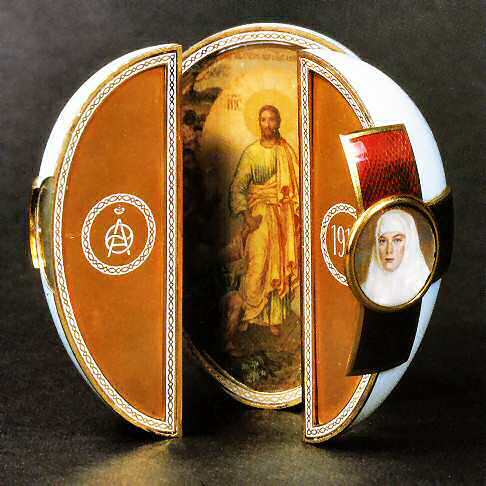 The white enamel on this gold-mounted egg is decor ated with a translucent red enamel cross on either side. The center of each cross is set with a painted miniature of respectively the Grand Duchess Olga and the Grand duchess Tatiana in their Red Cross uniforms. 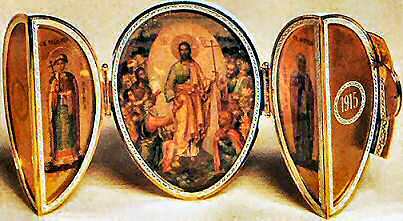 The front cross with the portrait of Tatiana serves as a clasp, securing the double opening doors. The front of the egg divides into two quarters when opened, reveals a triptych within. The central scene is the Harrowing of Hell, the Orthodox representation of the Resurrection. Saint Olga, the founder of Christianity in Russia is represented on the left wing of the triptych. The martyr Saint Tatiana on the right. The interior miniatures are executed by Adrian Prachow, who specialized in icons. The remaining two panels of the doors are inscribed with the crown monogram of the tsarina, and the other one with the year "1915". The two miniature portraits of the two Grand Duchesses are probably by the court painter Vasilii Zuiev, who painted the miniatures for the companion Red Cross Portraits Egg. This is one of the few Imperial Easter Eggs that opens vertically. The 1913 Winter Egg is another. This appears to be the only time when the eggs for the two Tsarinas in the same year could be regarded as obvious companion pieces. There is a more subtle connection between the 1916 Eggs. Nicholas II had been awarded the Cross of the Order of St. George in october 1915. The orange and black ribbon of the Order is used on the outside of Maria Feodorovna's 1916 Easter Egg, the Cross of St. George Egg, while the colors appear as part of the surprise in Alexandra Feodorovna's 1916 Steel Military Egg. When India Early Minshall purchased this Egg in 1944, she had already written "The Story of My Russian Cabinet", noting, "Fabergé was called the Cellini of the North, but I do not think any jeweler can ever be compared to him." In 1930 the Red Cross with Triptych Egg was sold by the Antikvariat in Moscow to an un described buyer. 1943 bought by India Early Minshall, widow of the founder of Pocahontas Oil Company , T. Ellis Minshall, at "A La Vieille Russie" in New York. 1965 Collection of the late India Early Minshall willed to the Cleveland Museum of Art, Ohio, United States.